If Donald Trump’s Environmental Protection Agency does not implement restrictions on pesticides advocated in a recent National Marine Fisheries Services report, environmental activists and commercial fisheries hoping to preserve Pacific Northwest stocks of “salmon, sturgeon, orca and other endangered species” may file lawsuits, the Guardian reported on Sunday. The 3,700-page NMFS report concluded that a trio of organophosphate pesticides (chlorpyrifos, diazinon and malathion) pose a serious hazard to numerous endangered and threatened species and can leak into the environment via agricultural and environmental runoff. But EPA administrator Scott Pruitt reversed a Barack Obama-era initiative to ban chlorpyrifos—which his own scientists concluded can hamper the development of children’s brains—earlier this year at the same time he was meeting with Andrew Liveris, the then-head of its manufacturer, Dow Chemical Company. According to the Guardian, Save Our Wild Salmon Coalition executive director Joseph Bogaard says both orcas and wild salmon populations in the Pacific Northwest are being devastated by pesticides, with salmon hovering around five to six percent of historic population size. 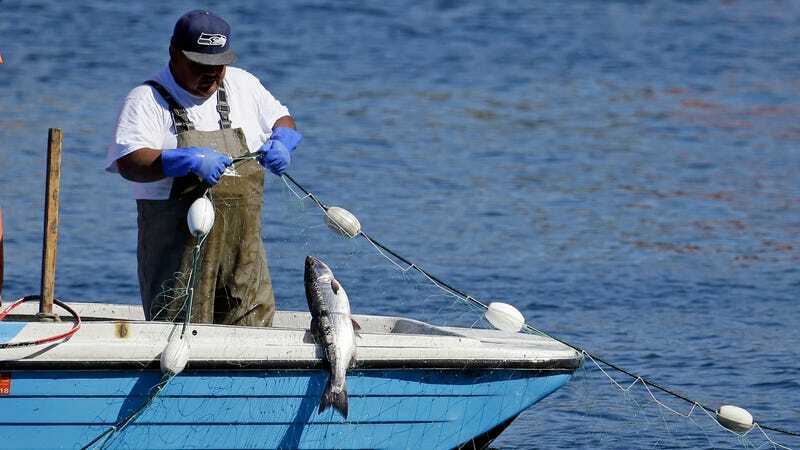 Another group, the Pacific Coast Federation of Fishermen’s Associations, told the paper that it would consider a lawsuit if Trump’s administration did not implement the NMFS-recommended restrictions, which include rules on buffer zones and spray reduction technology. As the Guardian noted, Trump’s administration fought the publication of the NMFS report in the first place in court—just as it’s sought to hide or silence unflattering or inconvenient scientific findings in a number of other settings, like research into climate change. Pruitt has stuffed the EPA with a number of personnel who used to be lobbyists for the industries they are now regulating at the same time it’s backed away from restricting toxic substances like chlorpyrifos, methylene chloride, and trichloroethylene, among others.